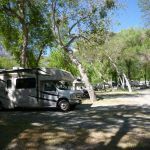 Ask fellow campers about "Bonita Ranch" and nearby attractions. This was an accidental find. Our truck broke and we had to get a tow to the closest RV park. Stayed here 4 nights. Staff was very accommodating with our day-to-day extending with the approx done day of our truck. No issues. 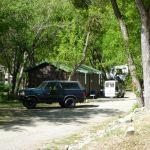 Nice camp.. friendly full timers, loved their laundry facility... it was on your honor to pay them but it was nice being able to do a small load or run the dryer for a few more mins. You just paid the front desk. Only bad thing is we had "no service" and I mean zero, zip, zilch... we would have to drive all the way down the hill to get bars. AT&T. One of the full timers had Verizon and she could get service. We camped at Bonita Ranch in a Fifth Wheel. This is an OK spot to stay if you need to be around the Northeast corner of the LA area. An interesting drive from I-5, one might think to be lost, but it shows up on the Garmin. It is not fancy, old, lots of permanent sites. It is a little tight to get in and out of, but cheap. We camped at Bonita Ranch in a Motorhome. Has about 25 sites with cable and full hookups. The rest are water and electric. Has a dump station. There are lots of shade trees. Its a very pretty setting. Manager is hard to find. We camped at Bonita Ranch in a Motorhome. Are you affiliated with Bonita Ranch ?